A 2005 Association of American Publishers survey says 82% of adults dream of completing a book, but only 5% of them ever do so. Let me help you be one of the 5%. As anyone who’s made the attempt knows, the path to successfully producing a book or any writing project that’s close to your heart has many barriers. 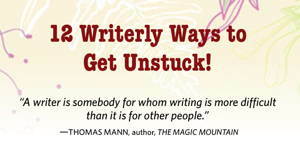 Are any of these challenges holding you back from your writerly dreams? You’ve been focused on raising children and/or furthering your career and you find it difficult to change gears. You can’t get past thoughts that you’re too old to start writing NOW. You’re riddled with crushing notions that you have nothing worthwhile to say. You get a million interruptions whenever you sit down to write. You’ve done a lot of report writing for work and find it hard to switch to writing from your heart. You’ve been waiting for inspiration to strike but inspiration seems to be on strike! The project you’re working on is all over the map and you can’t figure out how to structure it. You’ve made some progress on your novel or nonfiction but need some feedback before proceeding further. You’ve been working on this thing forever and can’t seem to get it done. identify and capitalize on your strengths as a writer. address your areas of challenge, so they don’t undermine your progress. devise effective strategies for keeping going in the face of obstacles, whether it’s family members who don’t get that writing is not a spectator sport, or an inner critic who doesn’t want you to write and is demonically creative at preventing you from doing so. set realistic and achievable goals to complete the different phases of your project within a reasonable timeline. develop a strong outline for your nonfiction book, so that you can progress with confidence and a clear sense of direction. determine what research you might need, so that your work has depth, substance and credibility. “chunk down” your project into its essential building blocks to shape your work and to provide you with short, manageable assignments for happy and productive writing days. create a realistic work schedule that takes work, family and self-care commitments into account and keeps you steadily moving forward. express yourself more freely, trust your own impulses, and allow your authentic voice to emerge. draw meaning from the events of your life and shape them into a readable and inspiring memoir. determine what is required to take your fiction or nonfiction work to the next level, whether that’s publication or further development. move through the anxiety that can prevent you from taking your work to the finish line. Click here to set up a 30-minute free phone or Skype “stoke your writerly fire” conversation to figure out what kind of support is write for you! You can accomplish a lot in this “power hour” writers’ coaching session. Here are some examples. Jumpstart a daily writing practice. Get a reality check on a writing project you’re considering. Set priorities when you have several projects you want to complete. Get quick feedback on a work in progress (1000 words or less, 30 minutes to read, 30 minutes to discuss). Develop a strategy for meeting a writing deadline. SPECIAL BONUS: A follow-up email to highlight key discoveries and commitments. Written assessment of the following aspects of your work, as applicable – readability, content/concept, theme, style, structure, story, plot, subplots, setting, characterization, dialogue/narration, and marketability. Follow-up coaching call, 30-60 minutes in duration (depending on the length/complexity of the project) to discuss the assessment, to clarify outstanding issues, next steps, etc. Written assessment of screenplay with commentary on story, plot, structure, characterization, dialogue, setting, theme, etc., as well as notes on readability, formatting, and marketability. One-on-one coaching + unlimited email coaching to establish 3-5 key goals, to create and sustain a writing plan, and to address resistance and other barriers to productivity. For a nonfiction or fiction work, includes 10 hours of work-in-progress assessment and/or developmental/ substantive editing. For a screenplay, includes 10 hours of work-in-progress assessment and/or story editing. One-on-one telephone or Skype coaching to help you conceive, organize, and begin your book. A wrap-up process to ensure that you leave the session with a clear writing plan and the motivation to get writing! One-on-one telephone or Skype coaching to hone your vision, establish realistic goals, and generate a doable plan. A wrap-up process to ensure that you leave the session inspired and clear about next steps. If my family didn’t want me to write about them, they should’ve behaved better. I have never written a book that was not born out of a question I needed to answer for myself. Well, my book is written—let it go. But if I were only to write over again there wouldn’t be so many things left out. They burn in me; and they keep multiplying; but now they can’t ever be said. And besides, they would require a library—and a pen warmed up in hell. Imagine that you’re at the end of your life. Without hesitating, without thinking, write the story that you’ve lived in five sentences.